Schumacher's 3A 6/12V battery charger and maintainer is fully automatic and microprocessor-controlled, with multi-stage charging for added precision, safety and battery life. 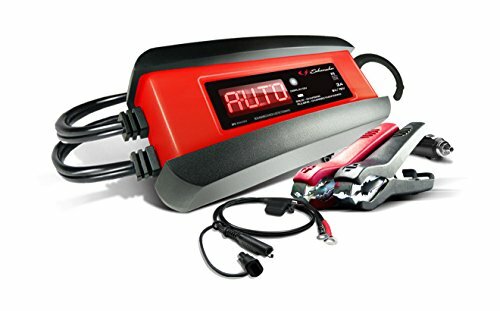 This 3 Amp battery charger/maintainer keeps stored lead-acid batteries charged, and charges and maintains small batteries. The hook attachment allows you to hang it outside the work area for safety and convenience. Auto-voltage detection automatically detects 6 or 12 Volt batteries. Float-mode monitoring automatically maintains optimum battery charge. Reverse hook-up protection helps protect battery and charger from damage. Simply press the display button to show the charge progress, with a scrolling digital that provides easy-to-read, step-by-step instructions to properly charge your battery.